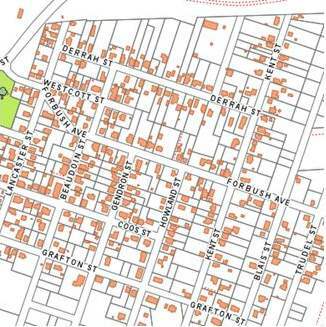 Includes Forbush Avenue and area east of Lancaster: Beaudoin, Gendron, Howland, Kent, Derrah, and Blais Streets; east part of Grafton. Forbush Park was named for its developer, local Berlin businessman Alpha B. Forbush. Forbush was a jeweler, bank president and owner of the Forbush Water Company which supplied water to Berlin’s east side. The first plan of Forbush Park appears to have been done by R.W. Libby in 1905, although it is not clear whether this plan was actually acted upon. An addition was made to the 1905 plan in June 1911 (plan done by L.J. Wertheum recorded liber 151, folio 401). Finally, as reported in the November 12, 1916 Berlin Reporter Forbush Park was surveyed by Stark Wilson in July 1914 (Liber 178; Folio 401). The roads as surveyed by Stark were accepted by the city at the time of the Reporter article. 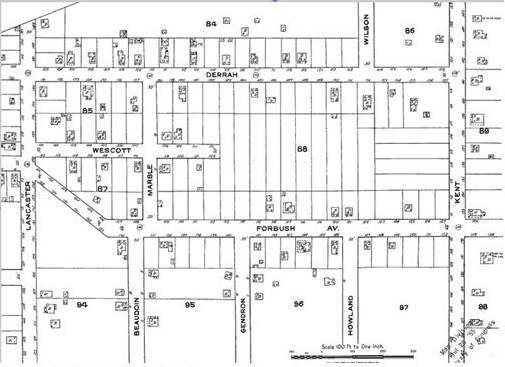 That same year (1916) building permits were issued for four houses in Forbush Park (Berlin Annual Report).